Acadie-Bathurst Titan General Manager Sylvain Couturier is anxious to get the 2016-17 Quebec Major Junior Hockey League regular season started. 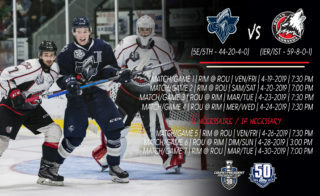 The Titan, who are beginning the third year of a rebuilding program, finished the pre-season with a 10-2 win over the Moncton Wildcats on Sept. 16 at the J.K. Irving Centre in Bouctouche, NB. With their win over the Wildcats, the Titan finished the pre-season with a 4-4-1 record, including a 1-1-1 record in the inaugural Hub City Showcase rookie tournament Moncton from Aug. 19 to 21 in Moncton. “As far as the wins and losses, that is not our primary target for training camp,” said Couturier. “Obviously you like to win more games than you lose, but at the end of the day no championship is won in September. 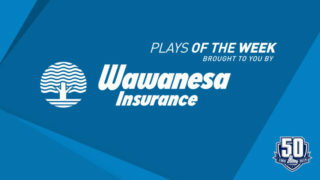 Several of those young players really stepped up during the pre-season, lead by rookie Aaron Brisebois finishing second in team scoring with four goals and five assists in seven games. William Lemay-Champagne, who suited up for just three games last season, finished fourth in team scoring with seven points in seven exhibition games. Sophomore forward Daniil Miromanov led all Titan players in pre-season scoring, with six goals and six assists, while suiting up for just six exhibition games. Despite having a relatively young team, Couturier said the goal is to have the Titan finish in the top half of the league’s overall standings this season. 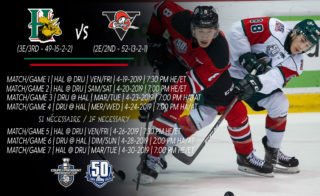 Acadie-Bathurst opens the regular season on the road with a pair of games, on back-to-back nights, Sept. 23 and 24 at Centre 200 in Sydney, N.S. against the Cape Breton Screaming Eagles. Head coach Mario Pouliot said his focus has been on making sure his team is ready for that opening weekend. Gone from the lineup this season are forward Mark Simpson as well as defenceman Mark Trickett and Garrett Johnston, who are too old for junior hockey now; as well as former Captain Guillaume Brisebois, who was traded to Charlottetown during the offseason; Nicholas Blanchard, Egor Popov, Emanuel Aucoin, Jake Barter, Jason Bell, Francis Thibeault, Keegan Gauthier, Yan Plourde and goaltenders Tanner Somers and Marc Audet. In addition to Brisebois, newcomers include forwards Kynan Berger, Jonathan Bourcier and Daniil Sokolka; defencemen Luc Deschênes, Olivier Desjardins, first round draft pick Noah Dobson and Igor Galygin; as well as back-up goaltender Danil Timchenko. 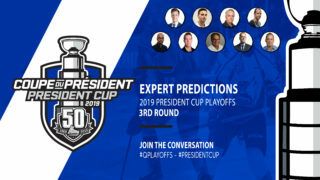 Returning players include forwards Miromanov, Lemay-Champagne, Christophe Boivin, Vladimir Kuznetsov, Samuel L’Italien, Jordan Maher, Antoine Morand, Cole Rafuse, Dawson Theede and Jeffrey Viel who has been named the team’s new captain; defencemen Félix Boivin, Nicolas Dumulong, Elijah Francis and Jérôme Gravel; and goaltender Reilly Pickard. “Obviously we’ve got a lot of depth up front,” said Couturier. “But most of the teams that have won in this league are good in the back end. “For us that starts with Reilly Pickard. I think Reilly proved to be a really good number one (goaltender) in the league and he is only 18-years-old this year. We have all of our trust in Reilly and he proved last year that he is one of the elite players in the league. As for the team’s forwards, other than Miromanov, the club’s veterans had struggled heading into the team’s final exhibition game, it is something Couturier wasn’t concerned about. “Are we worried – not really,” he said. “I think our top six, which should be our strength this year, are not performing. I think our bottom six are doing most of the job, but when it starts on Sept. 23 I think we will be back to normal. 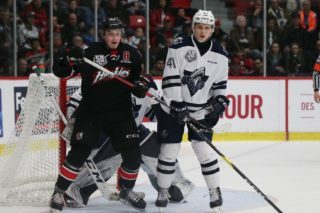 Kuznetsov and Bourcier showed signs of that against Moncton, in the team’s final exhibition game, with Kuznetsov potting a pair of goals and Bourcier scoring for the first time in the pre-season. Maher also had a big game for the Titan, with a goal and three assists; while Miromanov had two goals and two helpers, Theede had two goals and an assist and l’Italien had three points, including a pair of assists. “It is really nice to see the way guys like l’Italien, Theede, Miromanov, Berger and Rafuse have performed so far. 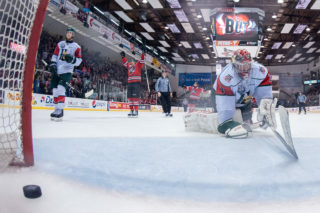 After opening in Cape Breton, the Titan play their home opener on Sept. 30 against former captain Guillaume Brisebois and the Charlottetown Islanders at the K. C. Irving Regional Centre in Bathurst.